If you are starting a relationship with God want to know him and grow in him more and experience him in life and you’re asking the question, “How can I find know him?” The answer is pretty easy for us and taking those initial steps as human beings. God made it clear. God has revealed himself in two ways. We call it both general and special revelation. General revelation, we look at things like creation. God made creation and it’s his handiwork. The Bible tells us some Romans 1, the evidence of who he is as seen in his creation. But God is also given a special revelation. The word revelation means unveiling. It’s a Latin word. God has revealed Himself to us. Special revelation for a Christian comes in two ways. One is in Jesus and the other is through God’s Word. Picking up God’s Word is especially important. God has written his word down so that we don’t mistaken his identity but we can come to understand him. It’s in written form because truth does not change. From generation to generation we can all come to know the same God. So maybe you’re looking at the Bible for the first time and you wondering where should you start? It is important for you to know that the Bible is not put together chronologically. It’s broken out categorically. The Old Testament is made up of 39 books. The New Testament is made up of 27 books. In the Old Testament the first five books were written by Moses, followed by 12 historical books, followed by 5 poetry books and then it ends in the prosthetic books. In the New Testament, you have the four Gospels. Then you have the book of Acts, which records the history of the church and the way the Holy Spirit empowers then. Then you have the Epistles, which are letters. The first ones you encounter are by the Apostle Paul. Those aren’t even ranked for us according to chronology. They’re actually ranked according to the length of the letter. The longer the letter Paul wrote, the closer it is to the book of Acts. The short the letter, the farther it is from the book of Acts. Then you have the general epistles after that, written by Peter and Jude and James and John. Then finally the Book of Revelation. When it comes to starting God’s word, I can say the Bible is all about Jesus. The Old Testament is the revealing of Christ. God has been pursuing you from beginning to end in a relationship with him. The Old Testament of foreshadowing of Jesus. The New Testament points back to Jesus and the Gospels reveal Jesus. I would encourage you, if you want to know this Jesus, to start in the book of John. Johns book was written to the world. It’s the gospel account of Christ. You can take a chapter a day for three weeks and just go through that and get to know Jesus as Jesus has revealed himself for you that you may enjoy him for eternity. After that I would jump around to some other important books of the New Testament, because the New Testament paints the fuller picture of God’s revelation to us. 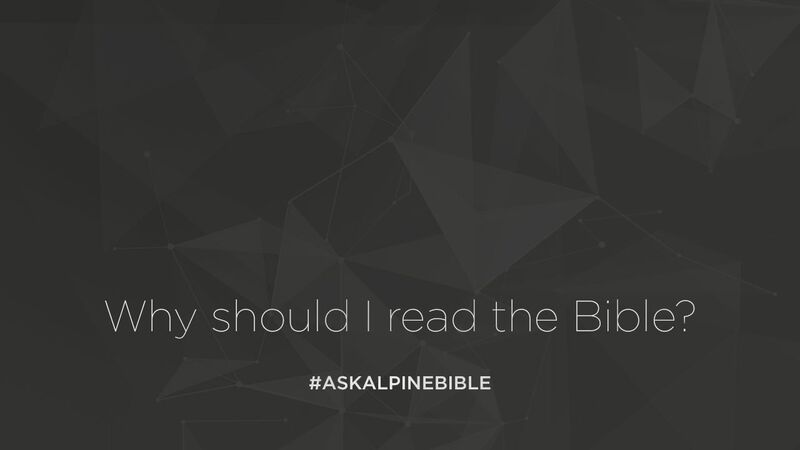 I would start with the book of Ephesians, or Galatians, or Philippians, or Colossians. Those are all great books. If you come out of a religious background and you want to see the significance of Jesus over religion, maybe even the book of Hebrews would be a great place for you to start. But here’s what is important: is that you start. Open up God’s Word. If you’re not plugged into a good biblically based church, that’s going to encourage you in God’s Word and give you a great family to encourage your relationship with God, I would invite you to join one. As you open up God’s Word, come and ask questions among the body of Christ. If there’s a hard part of you don’t understand, ask them about it. If you want, I would even check out a Bible that contains commentary that explains passages, so that you can better understand it. At the very least, start reading it. God gave you his word that you may know him and enjoy him all the days of your life.